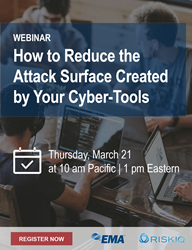 Enterprise Management Associates (EMA), a leading IT and data management research and consulting firm, today announced it will host a webinar titled “How to Reduce the Attack Surface Created by Your Cyber-Tools,” featuring David Monahan, managing research director of security and risk management at EMA, and Benjamin Powell, technical marketing manager at RiskIQ. Today, being connected online is a foundational aspect of many businesses. Everything from our computers and cars to phones and refrigerators are connected in the race to digital transformation. But it comes with a cost. Each connection we make provides access to our business services. That access can be used for the intended business process or for a malicious purpose. In fact, enterprises face 130,000 vulnerabilities to patch per month! That’s 10 new vulnerabilities per system per month. Undoubtedly, every device and application increases the cyber-attack surface. Even the very tools purchased for the intent of monitoring and securing environments increase the opportunity for threat actors to compromise systems and steal data.